Renu Multiplus - 6 months - Weblens - Your Contactlenses Online ! ReNu MultiPlus Fresh Lens Comfort multi-purpose solution provides intensive contact lenses, making you feel like you are using a new pair of lenses every day. ReNu MultiPlus Fresh Lens Comfort multi-purpose solution offers a cushion of comfort when wearing contact lenses. 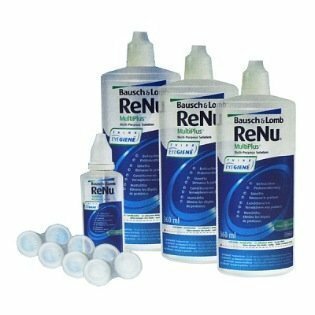 Use ReNu MultiPlus Fresh Lens Comfort multi-purpose solution for cleaning, rinsing, disinfecting and storing all soft contact lenses. With daily use ReNu MultiPlus Fresh lens Comfort removes multi-purpose solution from accumulated proteins. Experience the feeling of wearing a pair of new lenses every day. This package contains 3x360ml + 1x60ml bottles + 4 lens holders. Renu Multiplus from Bausch & Lomb. All in one liquid that intensively cleans your lenses and loosens the protein from the lens surface. Goede vloeistof, lage prijs, snel geleverd. Kortom, heel tevreden.